We eat a lot of chicken in our house, mostly chicken breast. So when I find a recipe that looks good to everyone I like to try it. I found this recipe while I was paging through a local grocery store flier. Our local Hy-Vee Store will list healthy recipes once in a while; this was the first time that I tried one of their recipes. This recipe uses quick oats to coat the chicken. I had never thought of using oatmeal as a coating for chicken, my interest was peeked and so I thought I would give it a try and see how it was. Along with the oats you use Parmesan cheese, dill weed, salt and pepper. We all like the breading although it could have maybe had a little more flavor. I could see adding some Italian seasoning to this or maybe some Rosemary, I think you get the idea, there is an endless amount of possibilities. I like the idea of serving these chicken strips instead of the fried ones, it is always good to go a little healthier. 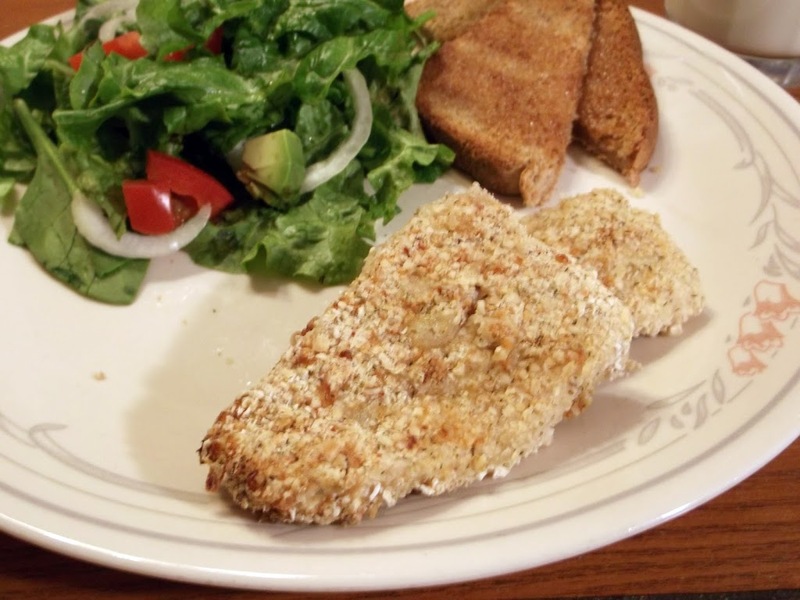 We served these with Dijon mustard; which added a nice flavor to these chicken strips. The other suggestions would be honey mustard or barbecue sauce. 1 Process oats, Parmesan, dill weed, pepper, and salt in a food processor until a coarse powder is formed, about 1 minute. Pour onto a large plate or wide shallow dish. 2. Whisk together egg and milk in another wide shallow dish. 3. Dip each chicken strip into the egg mixture allowing excess to drip off. Place in oat mixture and coat each chicken strip making sure all sides are covered. 4. 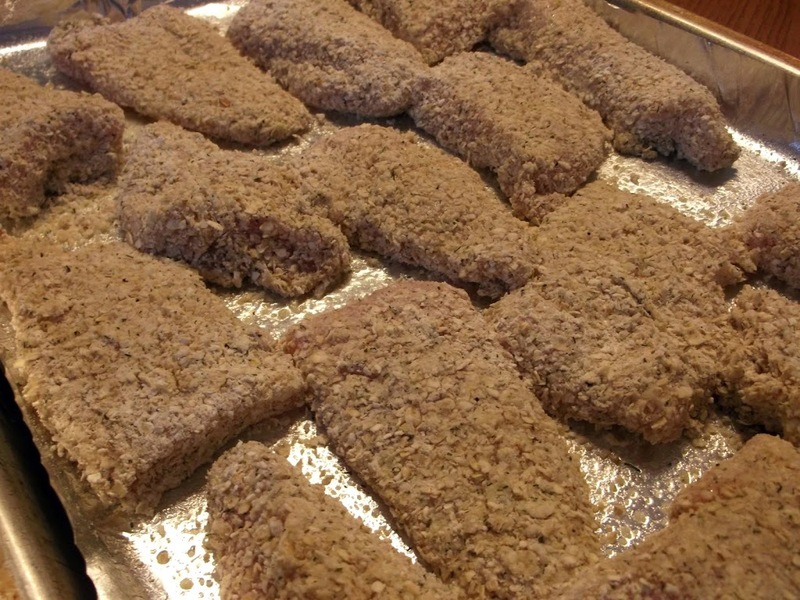 Place chicken tenders on a foil-lined baking sheet sprayed with non-stick cooking spray. Broil on high for 4 minutes, turn chicken strips and broil for another 4 minutes or until golden brown. 5. Serve with favorite dipping sauce. Enjoy!! Note: I doubled the recipe. I love the idea of oats as a crust! Good and healthy. Oats are also good in meatloaf in place of some of the crumbs. My whole family would like these. 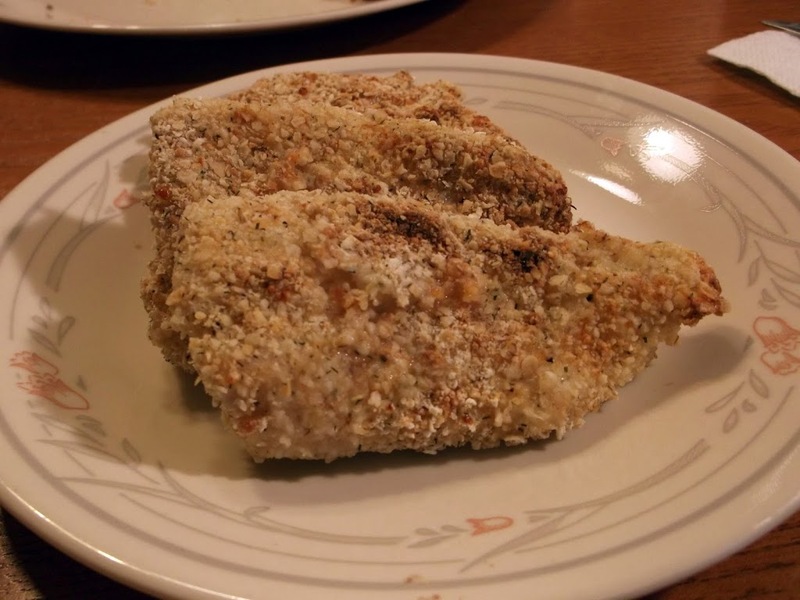 Great idea of using oatmeal and parmesan as a crust for this baked chicken…must taste delicious. I love that you used oats in your coating – what a great idea!